Quick Detach Mount: 20.45 oz. Min. Height (45-degree - Retracted): 6.25"
Max. Height (90-degree - Extended): 9.75"
Bipod Leg Length: 9" - 11"
You’ve spent countless hours choosing the components and assembling the rifle that fits you perfectly, all you need to be field ready is an Accu-Tac bipod. There’re a lot of bipods out there, but why leave it to chance? 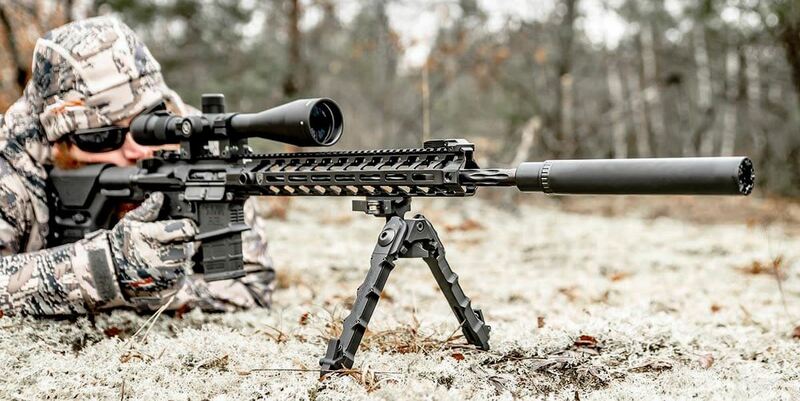 If you want a tactical bipod as good as the rifle you’ve poured your heart and bank account into, don’t settle. The Accu-Tac SR-5 Bipod is an American made, top of the line tactical bipod assembled of precision machined billet aluminum parts. It’s the bipod your weapon system deserves. The Accu-Tac SR-5 Bipod provides a stable support system for your rifle, regardless of the surface you find yourself on. Leg extensions feature a ratcheting latch system that is easy to extend, just give a pull to the length you want. Retracting them is even easier. They’re spring loaded so all you have to do is pull the latch open the leg will retract to its shortest station automatically. The Accu-Tac Bipod's leg extensions adjust to five different heights between 6.25 inches and 9.75 inches. Since each leg adjusts independently and can be deployed and locked into either forward of rearward positions of 45 and 90 degrees from center. Even on uneven surfaces, the adjustability of the Accu-Tac guarantees a solid rest that won’t compromise the accuracy of your shot. The Accu-Tac SR-5 is available in standard Picatinny mount and Quick Detach mounting styles to fit your existing hardware. Each leg is fully machined with scalloped contours and hard anodized to a flat black finish for a look and feel worthy of your best build. The Accu-Tac SR-5 Bipod comes in: Standard Picatinny Rail Mount or Quick Detach (QD) Picatinny Rail Mount. Many bipod options out there but when your looking to invest on top quality to match the rifle you’ve poured your heart and funds into, don’t settle. This IS the bipod for you (and me)!